Often when I write about restaurants, I make mention of a gluten-free menu, a separate menu made available by the restaurant listing only their gluten-free options. Occasionally, I’ll mention an integrated menu where gluten-free dishes are indicated with an icon of some sort on the menu. 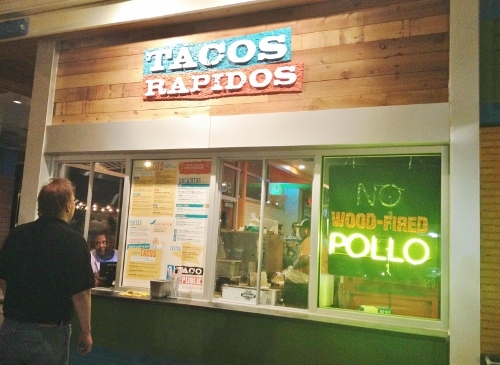 Never before have I written about a place with a menu like Taco Republic. 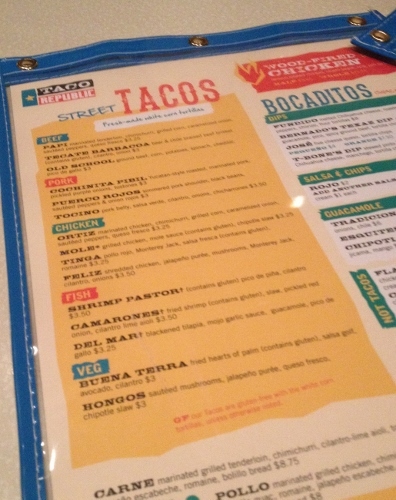 You see, instead of their menu mentioning the items that are gluten-free, they indicate items that CONTAIN gluten. There are far fewer items that contain gluten here than the gluten-free options. This makes me downright giddy. Their menu is a welcome relief to anyone who doesn’t eat gluten. No shortage of options here! 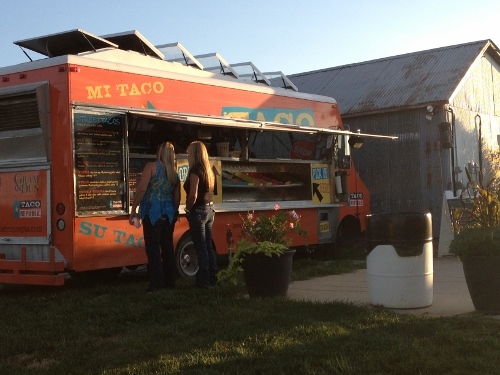 I first knew of Taco Republic as a food truck. 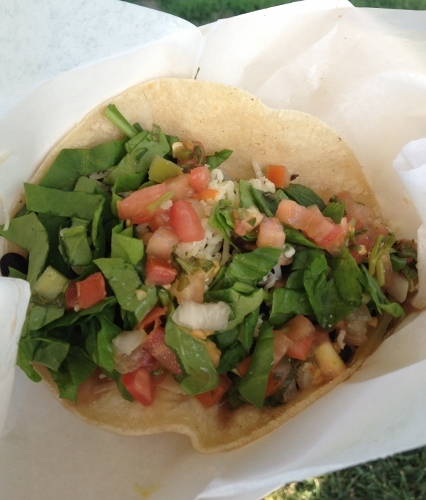 Last Summer, while at Fahrmeier Farms Tomato Day, I had a delicious veggie taco from the truck. I asked about gluten-free options and was so happy to hear the response, that the majority of their dishes are gluten-free and would be at their soon-to-open restaurant. 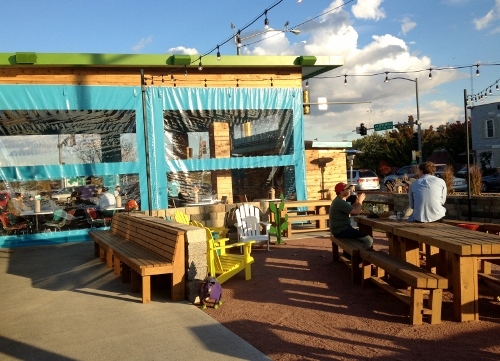 All summer I would hopefully glance at the corner opposite of the famed Oklahoma Joe’s to see what was happening with Taco Republic’s new space, a reclaimed gas station that had been an eye sore. Bright colors started popping up on the exterior. 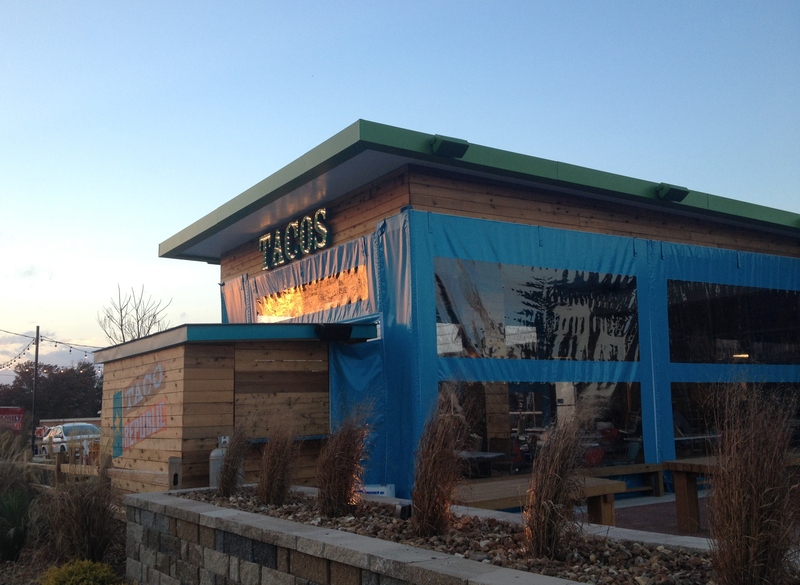 Every time I drove by I got more excited about a delicious taco option. And then they were open. I knew, having food intolerances, I should probably wait for the buzz to die down, for the new to wear off a bit before venturing out. It’s never a good idea to expect an overwhelmed kitchen to be mindful of food restrictions. But I couldn’t wait, I wanted tacos! We went within the first couple of days they were open and were definitely not disappointed! 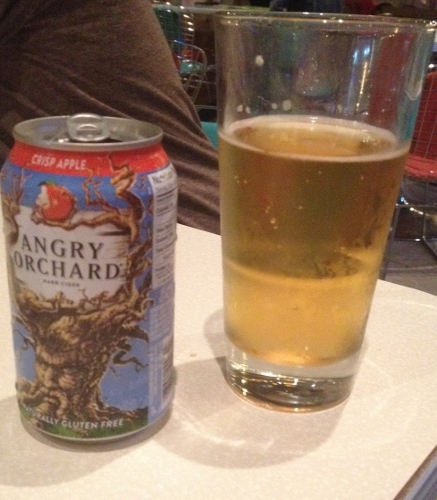 Two things about drinks before moving on to food: First, Angry Orchard in a can. Love seeing a gluten-free cider offered. 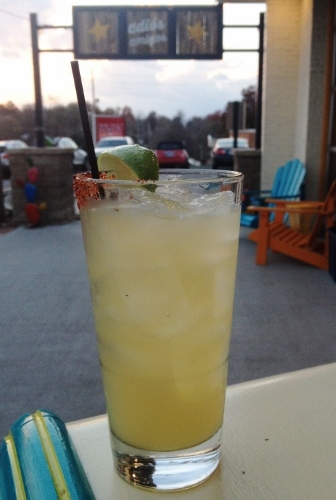 Second, get a specialty margarita here. The best $8 I’ve spent in a long time: their plantain republic margarita. Cabrito Reposado, lime juice, John D. Taylor’s Velvet Falernum, spiced plantain simple syrup made in house. If Summer and Autumn collided in a cocktail, this would be the result. And if you are a tequila snob, I counted around 30 tequilas available here. I should tell you all about the chipotle salsa that I adore, the perfectly made guacamole and the five cheese queso I ate one night while on a dairy bender, but what I really want to tell you about is the corn. Yep, corn. Elotes, Mexican street corn. But done better than any I’ve had in Mexico or from the trucks on street corners peddling corn all over the Southwest. Taco Republic grills their corn, just lightly blackened, smears it with cilantro mayo and sprinkles it liberally with cojita cheese and chile pequin. Not gonna lie, I would drive across town just for this. chipotle slaw all in a freshly made white corn tortilla. One taco and an ear of corn is plenty for a meal for me, the tacos are packed full. 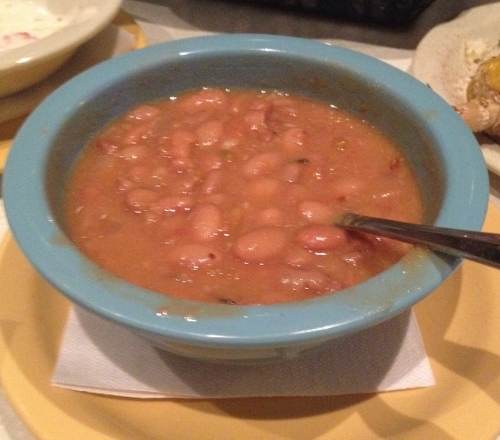 The Rancheros beans are quite delicious, too. I can see these becoming a favored comfort food in the winter. The bowl was a plentiful serving, more than I usually get when ordering a side dish. With chips and salsa, it would have made a perfect small meal. 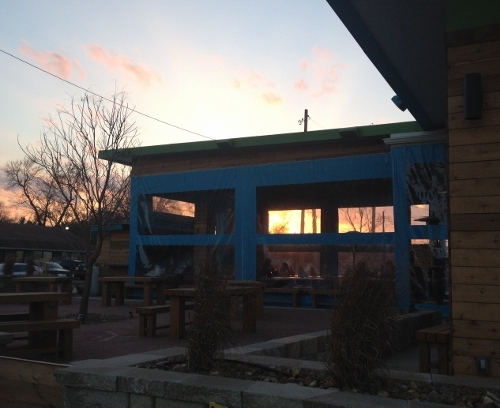 When Taco Republic first opened, the weather was warm and I enjoyed sitting outside under what was the canopy of the gas station. 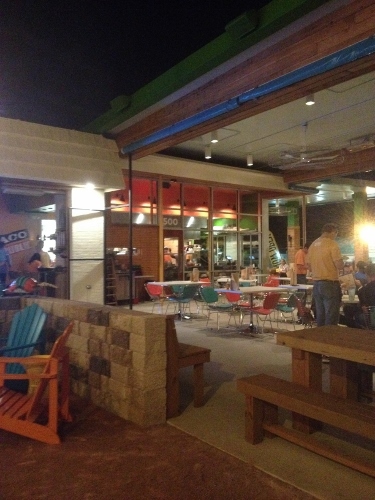 While grabbing late night tacos one evening, they were testing their heaters, nested 18 feet high up in the canopy. Our server pointed out that they had curtains to enclose the space for the cold weather months. There is also inside dining space. I’ve dined inside twice now and it’s nice. Not cramped, not overly loud, just as comfortable as sitting outdoors here. 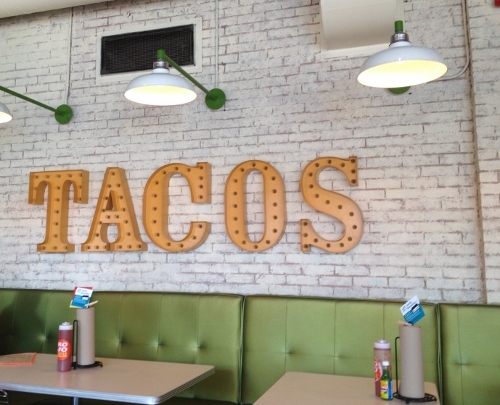 I haven’t been to Taco Republic for breakfast yet, but they do offer breakfast tacos. They also have a quick service/carry out window. There’s a neon sign, illuminated POLLO when they have rotisserie chicken to go, switching on the NO when they don’t. If you’ve tried either of these things, chime in below in the comments. I’d love to hear about them! 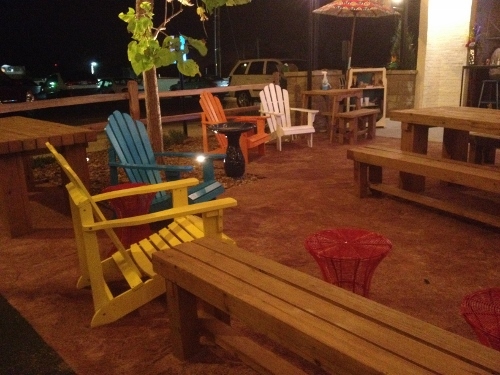 There’s comfortable seating and patio games outside if there is a wait for tables. Lots of picnic tables for dining outside beyond the canopy area, too. Such a nice spot for an outdoor evening! If there’s one down fall, it’s the parking. The lot is small, but there is plenty of parking at the nearby Walmart Neighborhood Market. That’s been terrific so far. But when the windchill is below zero, I don’t know how far I’ll walk from my car. Oh wait, I do. 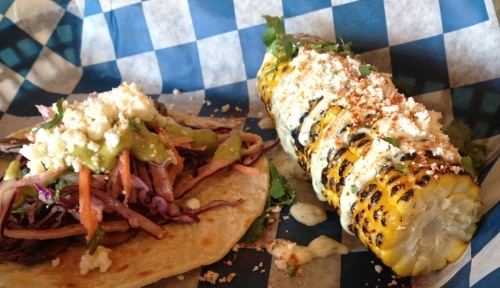 I’ll walk as far as necessary to get a hongos tacos and an ear of that amazing grilled corn. Taco Republic is located at 500 County Line Road, Kansas City, KS. 913.262.8226. Eat With: Minimal caution. I’ve been here multiple times prior to writing this and haven’t had a single gluten concern. That said, it’s always a good idea to let your server know about your food intolerances/allergies. Can’t be too careful!